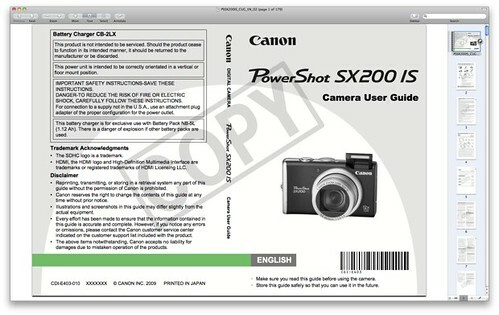 To download the online version of the English Language Canon SX200 IS owner’s manual / operating instructions (Canon calls it the “PowerShot SX200 IS Camera User Guide”), right-click this link to start the PDF download from Canon.com and save the user guide to your hard drive. If the download link didn’t work for you, go to the Brochures & Manuals download section for the SX200 IS and manually locate the file PSSX200IS_CUG_EN_03.pdf. The file size of 179-page Canon SX200 IS Adobe Acrobat PDF document is 7.9 MB (megabytes). The guide discusses the features of the SX200IS and how to use the camera. A couple of general pointers in Photography Tips. Digital Photography Secrets — Starts off with a free e-course on the basics of great photography. Popular Canon SX200 IS books and other printed literature and reading material in the Arts & Photography and Books section on Amazon.com. DVDs on Photography and Photography Tutorials. Canon SX200 IS – Main page.